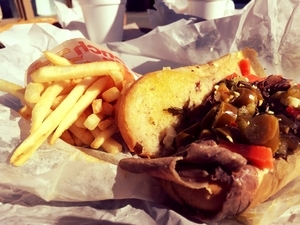 In the Chicagoland area, everyone knows that beer and Italian beef go together. While Italian beef is one of the many foods that the Windy City is known for, delicious brews from Anheuser-Busch have inspired numerous other trends throughout the years as well. Hold the ketchup if you're planning on getting your hands on an all-beef, mouth savoring hot dog from "Chi-Town". Before you begin your journey for brews & beef, let's take a closer look at how beer has influenced modern foodie trends in the Windy City. The history of Anheuser-Busch begins in the middle of the 1800s when numerous German immigrants arrived in St. Louis. This was where lager was first introduced in the United States, requiring more care and time to produce. Eberhard Anheuser, one of the founders, emigrated from Germany in 1843 and was a part owner of Bavarian Brewery, opening in 1852 despite training to be a soap manufacturer. By 1960, he had bought the other investors and changed the name of his brewery to E. Anheuser & Co.
Adolphus Busch eventually ended up working in St. Louis with a partnership in a business supplying breweries. He married Anheuser’s daughter and started working with his father-in-law, eventually buying half the company. Thus began the Anheuser-Busch name. Most beers of the time remained local, Busch had loftier goals and worked with Carl Conrad in 1876 to create a universal American-style lager, the first Budweiser. Throughout the years, Anheuser-Busch had numerous other innovations, including being the first brewer in the country to use pasteurization and then introducing artificial refrigeration, both of which let the beer be shipped long distances. This was crucial to the spread of Anheuser-Busch brews to Chicago and beyond. For as long as beer has been around, it has been linked to various meals and in the Windy City, beer and hot dogs have become a tradition. This tradition was made possible thanks to the efforts of Anheuser-Busch to spread their products across the country. Now, Chicagoans and visitors alike can enjoy a delicious brew with an equally yummy hot dog. Of course, you can also find other amazing pairings in the city, but hot dogs are the classic choice. The only question remains which hot dogs go best with the Anheuser-Busch brews and other beers you can get in Chicago. There are too many options to count, but some have quickly grown to become Windy City favorites. Superdawg has been family-owned since it opened in May 1948 right on the corner of Milwaukee, Nagle, and Devon. Since then, they have added another location in the suburbs, but the Chicago location is the classic choice. The building has always stood out with its two 12-foot-long hot dogs. It remains one of the few restaurants where you can enjoy a drive-in meal, just be responsible with your beer choice if you are driving. The other classic choice for hot dogs is the Wieners Circle along North Clark within Lincoln Park. This hot dog stand is known for the verbal abuse that is encouraged between the wait staff and customers. While foodies will suggest you have a hot dog, you can also get a burger. Even though ownership recently changed, the food and atmosphere remains the same, keeping foodies constantly rotating in and out of this hot-dog joint. Now all that’s left to do is choose which hot dog to eat in Chicago, order a cold brew, and enjoy a delicious meal. Pair your choice of beef & brews with some cheese fries from these Chicago hot spots. Cheers to Anheuser-Busch-- this one's for you!